T-Mobile Arena is a multi-purpose indoor arena on the Las Vegas Strip in Paradise, Nevada. Opened on April 6, 2016, the arena was built as a joint venture between MGM Resorts International and the Anschutz Entertainment Group. The arena is the home venue for the National Hockey League's Vegas Golden Knights, who began play in 2017. 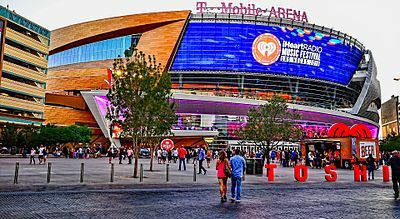 Since its opening, T-Mobile Arena has primarily been used for entertainment events such as concerts, and has been booked for mixed martial arts and professional boxing events, and well as other annual sporting events. It was used for the biggest fight in boxing history, as measured by pay-per-view revenue; Floyd Mayweather vs. Conor McGregor. The arena is accessed by a new development project known as The Park, with retail and dining space between New York-New York and the Park MGM casino hotels. ↑ Ritter, Ken (June 18, 2013). "AEG, MGM to Develop 20,000 Seat Las Vegas Strip Arena". The Denver Post. Digital First Media. Retrieved June 18, 2013. ↑ Collison, Kevin (June 18, 2013). "KC-Based Firm Populous to Design New Arena in Las Vegas". The Kansas City Star. Retrieved June 18, 2013. This page was last changed on 20 August 2018, at 20:18.